This Seiko clock model QXM282BRH is Limited Edition, only 2500 ever produced, also known as “Split Face”. 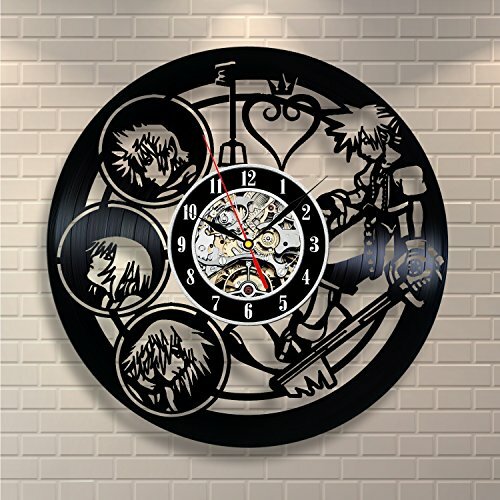 The clock plays 6 classic melodies and has 3 wheels with 8 sparkling Swarovski crystals. The Seiko QXM282BRH is Limited Edition of Seiko’s Melody in Motion clocks, also known as “Split Face”. It is round shaped clock, at first sight temperate, but yet somehow unusual and very elegant. The clock is constructed with the brown burled pattern plastic case. The face of the Seiko clock is mostly white, with a brown circle in the center with black Roman numbers and gold-tone hands. On every hour, one of 6 classic melodies starts to play, the case splits vertically into two parts, like a door, moving up and down. Behind the door, there are two figures on the left and the right side, moving forward and backward. In the center, 3 wheels with 8 sparkling Swarovski crystals rotate as the music plays. After that, while the song slowly ends, “door” is closing, returning the dial to the original shape. The light sensor will automatically turn off music and motions as soon as it becomes dark. The clock also features Volume control, Glass crystal, Presentation button, On/Off switch. In the end, all we can say is that the Seiko QXM282BRH is a beautiful melody in motion clock with amazing sound and definitely you won’t be disappointed if you choose it.